This is not only a really solid album as far as cartoon-character-driven holiday music goes, it's also solid for holiday music in general. This shouldn't be a surprise; much like My Little Pony: Friendship Is Magic, one of the major attractions of the Phineas and Ferb series is the music. The first eight songs are all from the Christmas special. Well, including one that was apparently written for the special but cut for time. These include the more show-centered songs which won't make much sense to those who haven't seen at least some of the series. "Winter Vacation" is a parody of the usual theme song. "What Does He Want?" Candace is singing about her boyfriend, but this actually works fine as a standalone song about the difficulty of shopping for someone you want to impress. "That Christmas Feeling" A solid original Christmas tune. 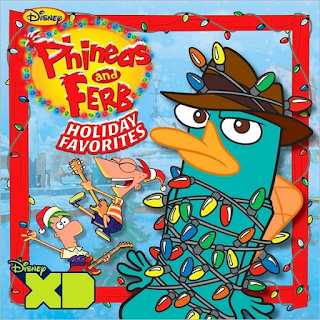 "I Really Don't Hate Christmas" This song by series villain Dr. Doofenshmirtz is a lot of fun if you can keep up with the rapid-fire patter lyrics. "Where Did We Go Wrong?" and "Danville for Niceness" both deal with the plot from the special. Fine, but not really exceptional. "Christmas is Starting Now" THIS is a great song. It's performed by Big Bad Voodoo Daddy with that big band sound, the rhymes are clever, the lyrics aren't really like any other holiday song I know, and the pace is just fast enough. This could go on anyone's holiday playlist. "Thank You Santa" A cute enough tune, but a little more like generic kids music. The rest of the songs are a mix between traditional carols and traditional carols with a unique spin. Three of them were part of the other holiday episode. I'm not sure I've given this version of "The Twelve Days of Christmas" enough credit in the past. It's one that changes up the lyrics to match the characters, but it also changes internally as the song progresses, which is always nice for a long song. "Good King Wenceslas" is from the episode and is a fun little cross between a character study and a history lesson. "Frosty the Snowman (Recorded as "Perry Saves Christmas")" I wouldn't have thought of making Frosty the Snowman an interesting song by making it about a secret agent platypus, but that's why I write blogs, not cartoon shows. "Let it Snow, Let it Snow, Let it Snow" Fine. This recording was in the special. "Run Rudolph Run" This is a pretty straight version of this song, but it's a good song and one that often gets left out of kids holiday music. "Santa Claus Is Comin' to Town" Sung by the in-show band Love Händel, this fast rock version isn't half bad. "We Wish You A Merry Christmas" A good choice to close out both the special mentioned above and this album. The high energy and additional verses spotlighting each character really elevate it, although unlike most of the songs in the second half, this one might not be comprehensible for those not already fans of the show. Overall this is a really fun album, a good blend of songs for fans of the characters and just plain fun holiday music that anyone could enjoy.